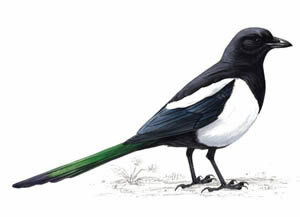 Magpies seem to be jacks of all trades – scavengers, predators and pest-destroyers, their challenging, almost arrogant attitude has won them few friends. When seen close-up its black plumage takes on an altogether more colourful hue with a purplish-blue iridescent sheen to the wing feathers, and a green gloss to the tail. Non-breeding birds will gather together in flocks. Found across England, Wales and Northern Ireland, but more localised in Scotland, absent from the Highlands. Seen in a range of habitats from lowland farmland to upland moors.